Hallelujah ! The roses are out so it has to be summer. They are out in all their gorgeousness and lusciousness and softness, and they are to be worshipped. 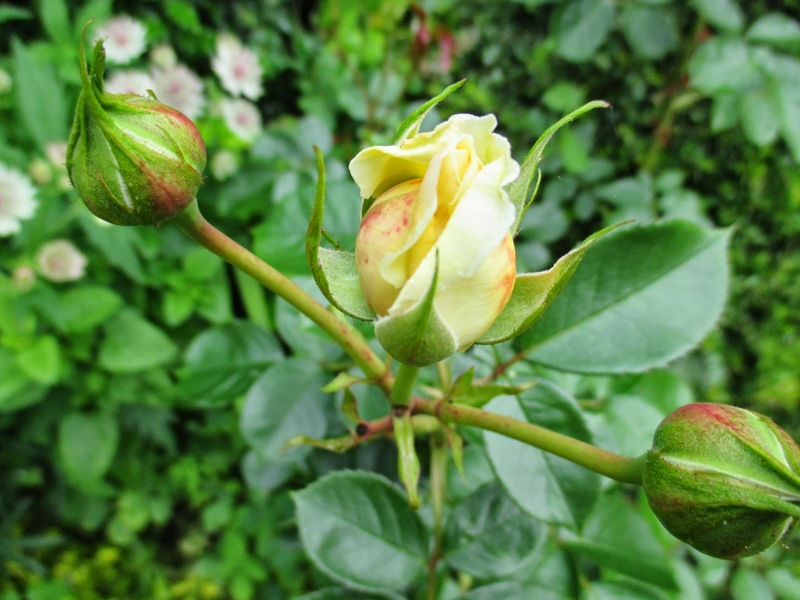 Because I am a Rose Geek and a bit of an anorak, I have listed all the roses in the garden and a little information about each. I have listed them in the order that you would come upon them in the garden, but, to be truly geeky, I should probably have listed them in their categories, like 'Patio' and 'climber'. 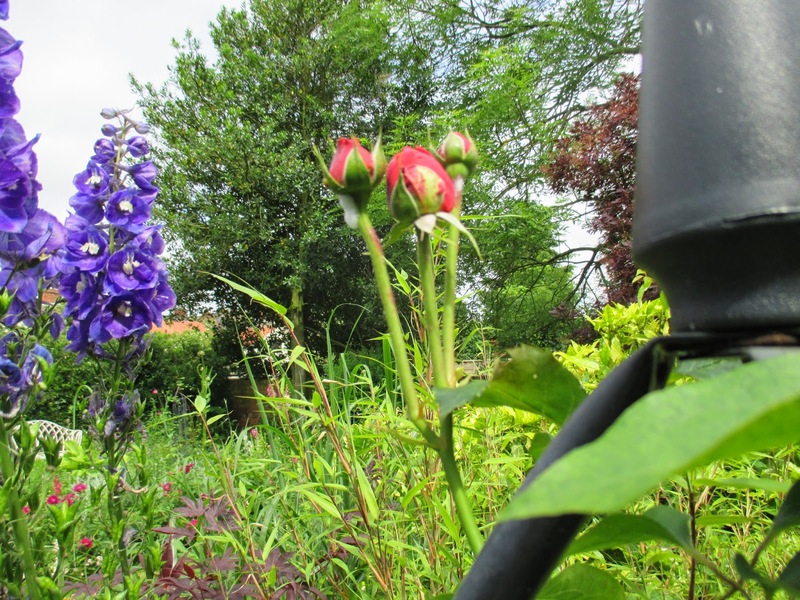 The rose at the top of this post is a Gallica, 'Charles De Mills', good scent but not a repeat flowerer, so you have to make the most of its fleeting beauty. It is currently struggling to hold its head up, due to the heavy ran we have had. I fear it will be an even briefer show than usual, this year. 'Bonica' is not quite in flower, but won't be long. 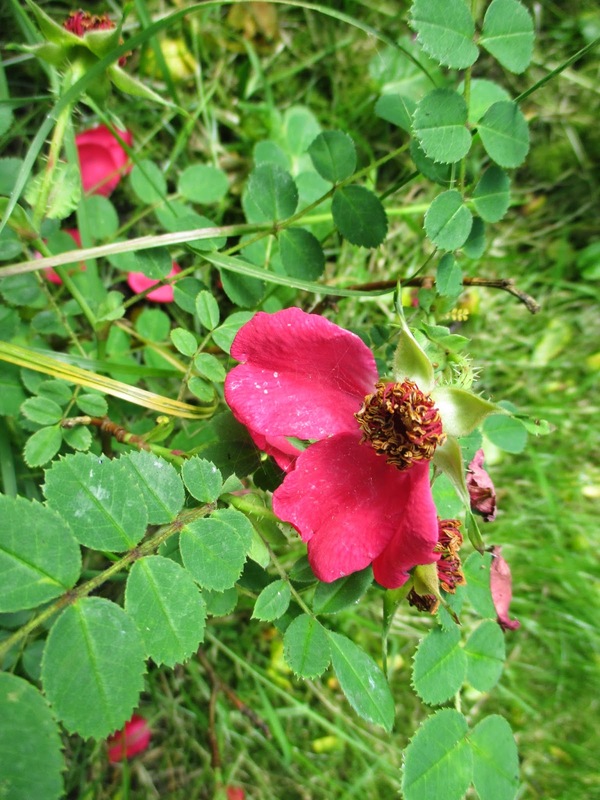 It is a modern shrub rose, which performs very reliably and is extremely healthy. It repeats well right into autumn. Another which will be in full flower very soon. I think this is the modern shrub rose 'Buff Beauty', another healthy, reliable, repeat flowerer. I lost the label years ago, so am never 100% sure that it really is 'Buff Beauty'. 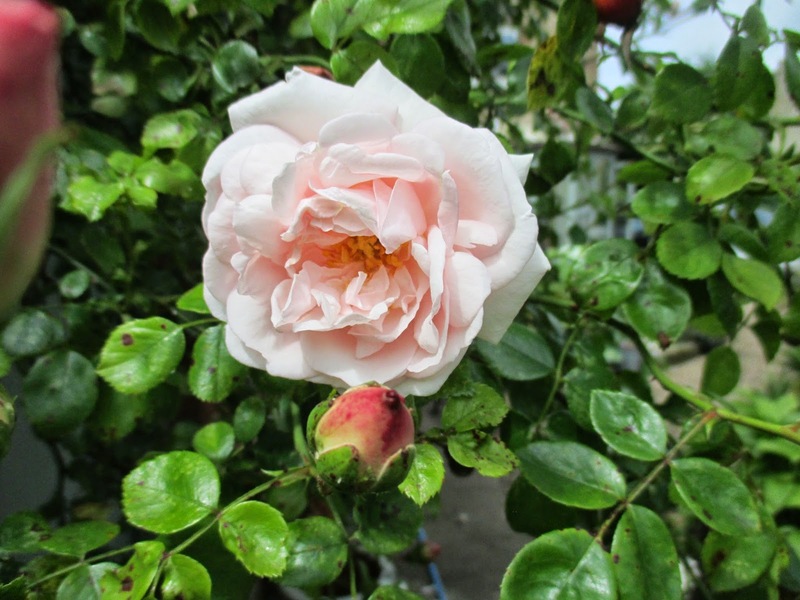 'Cinderella' is a vigorous climber with glossy leaves. It flowers prolifically right through from May to autumn. The books say it is only 2-3m tall, but mine clearly hasn't read the books, as it is 3m already and showing no signs of slowing down. 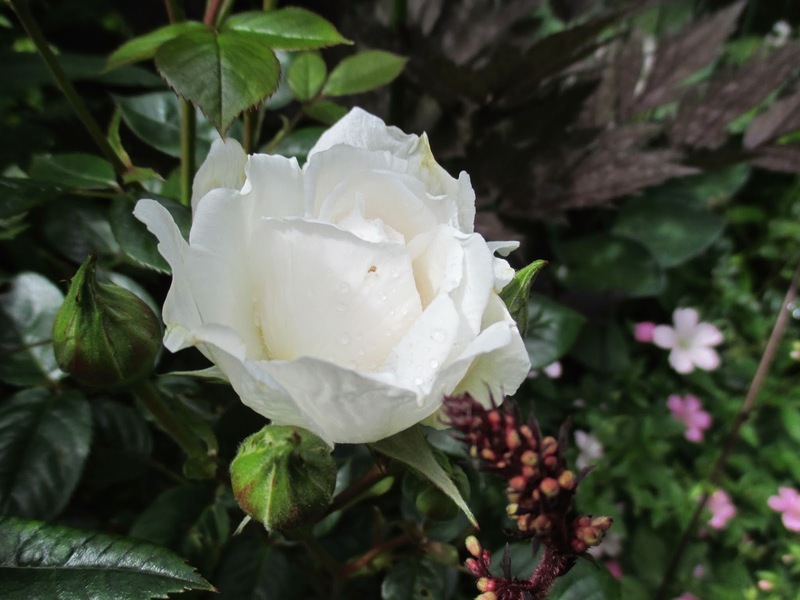 'White Cloud' a lovely pure white repeat flowering climber. 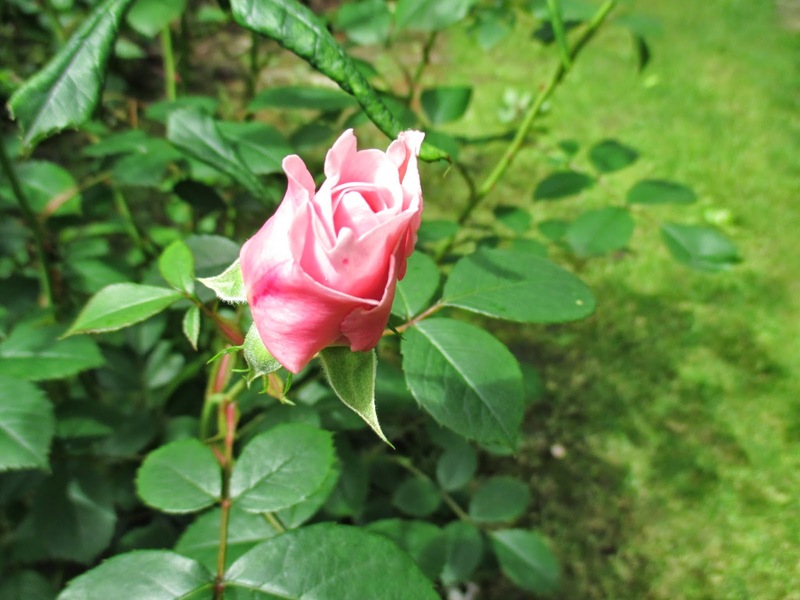 Often the first rose in the year to bloom, and the last to finish . Fantastic in the twilight as it just glows. 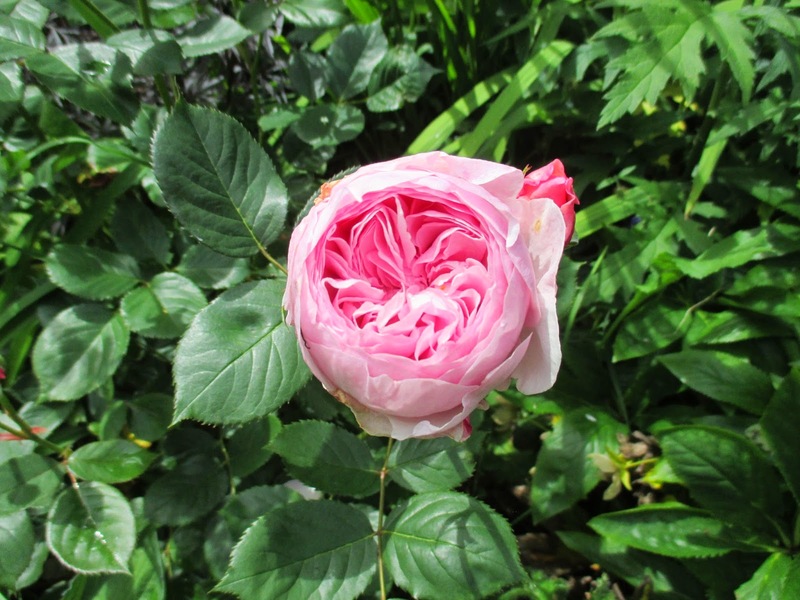 'Rosa Mundi', one of the oldest roses, with a fascinating history dating back to the 1600's. It has not bloomed yet, but it won't be long! 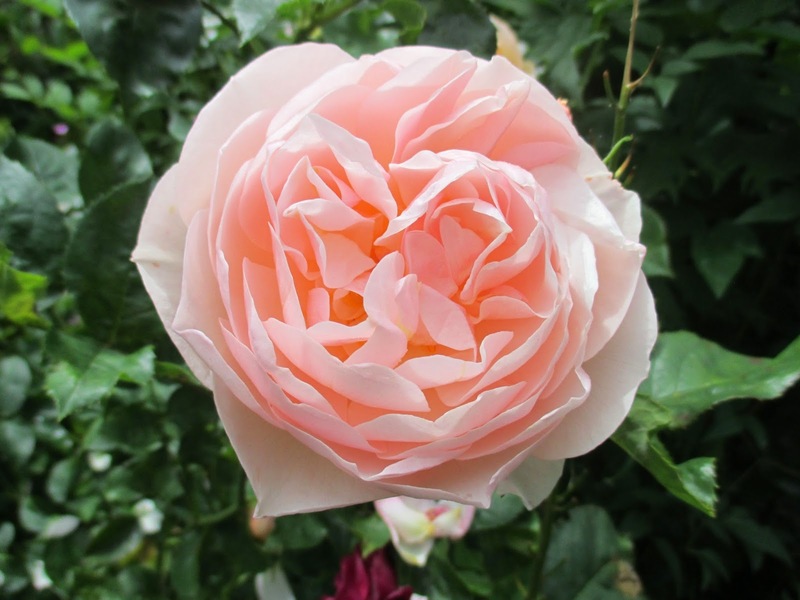 The David Austin English rose 'Abraham Derby'. This one was very slow to get going, but is turning into a lovely rose now. 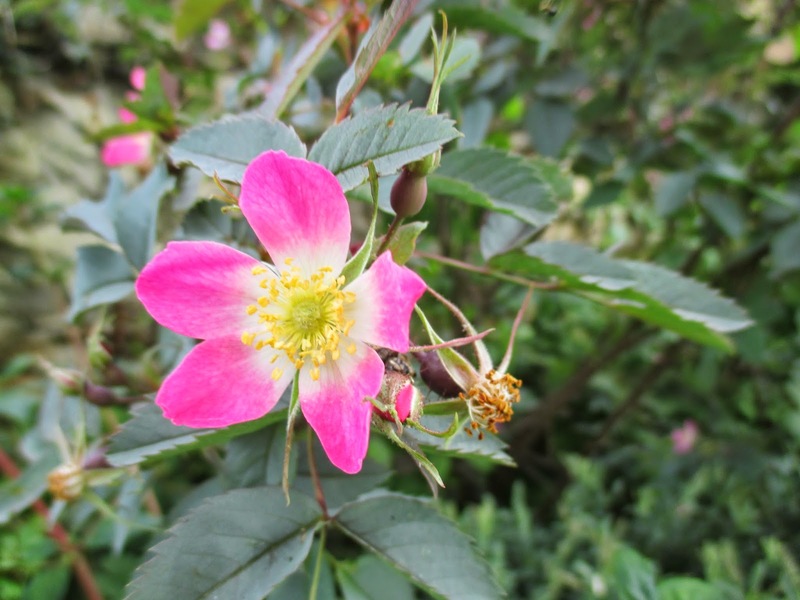 A most unusual and lovely rose - 'Alissar Princess of Phonaecia'. 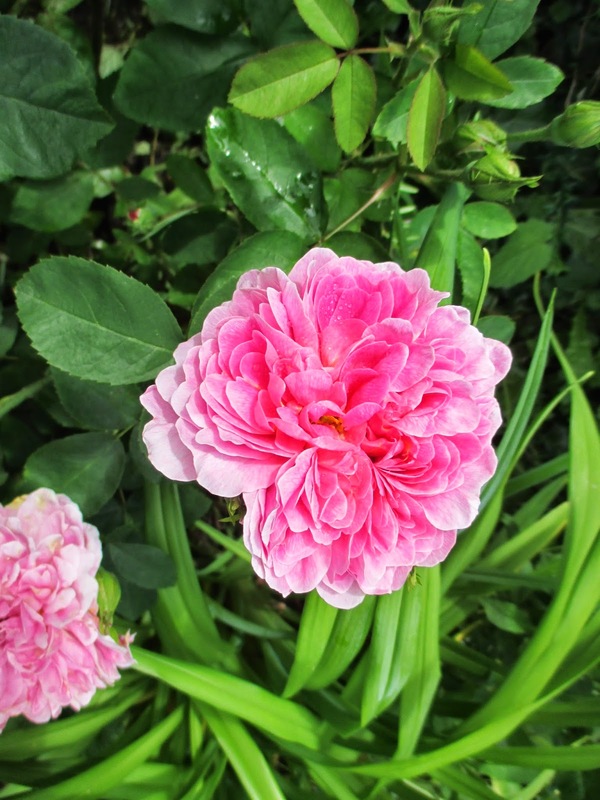 The single flowers are rimmed with vibrant pink, and the centre is a darkening splodge of raspberry. 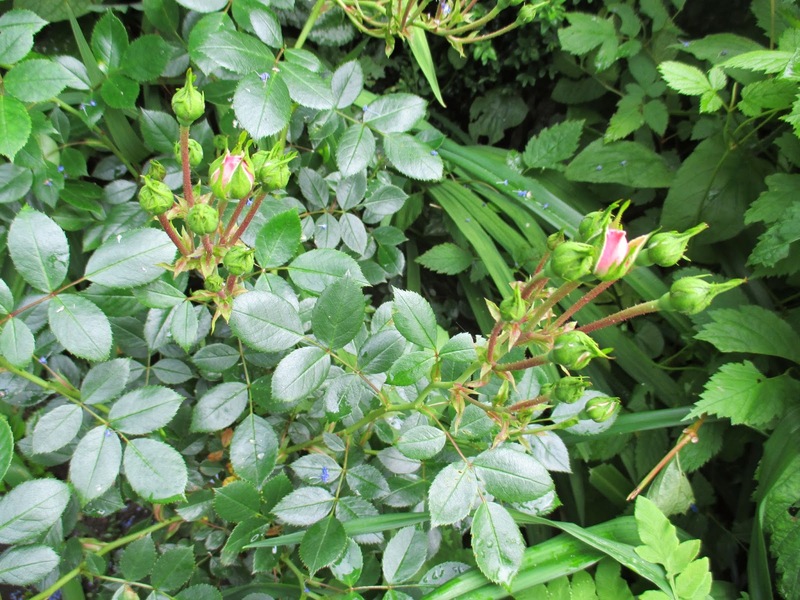 It is classed as a shrub rose, and seems to be a repeater, as it hasn't stopped flowering since May. 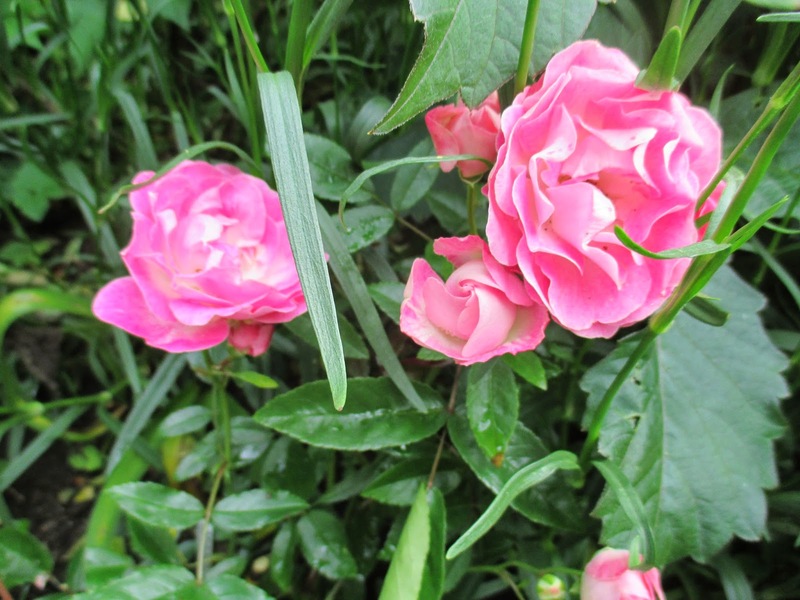 This is 'Pink Abundance' which flowers its socks off all season, and seems very resistant to black spot and fungal infections. It is classed as a Floribunda. 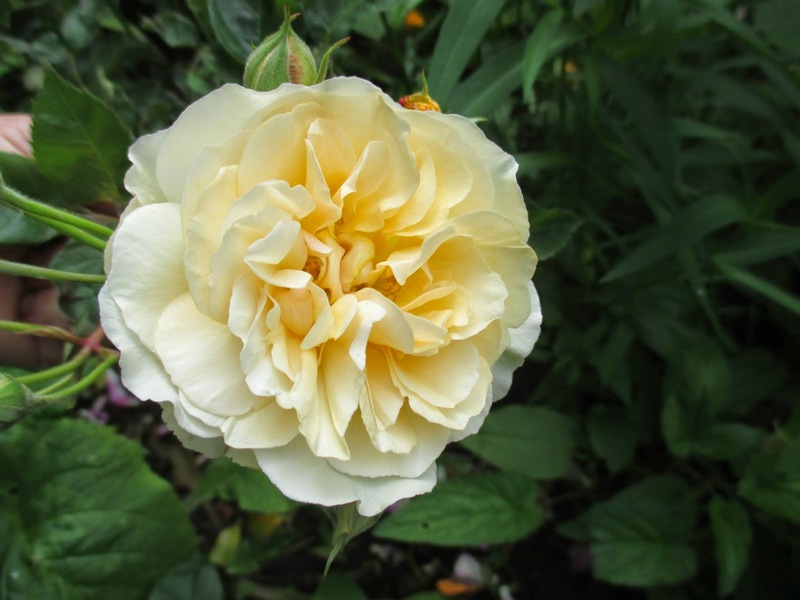 The first of the Patio roses, 'High Sheriff' is a very pale yellow. This is my first season of growing Patio roses, and I planted about ten bare root plants in early spring. I am interested to see how well they perform. 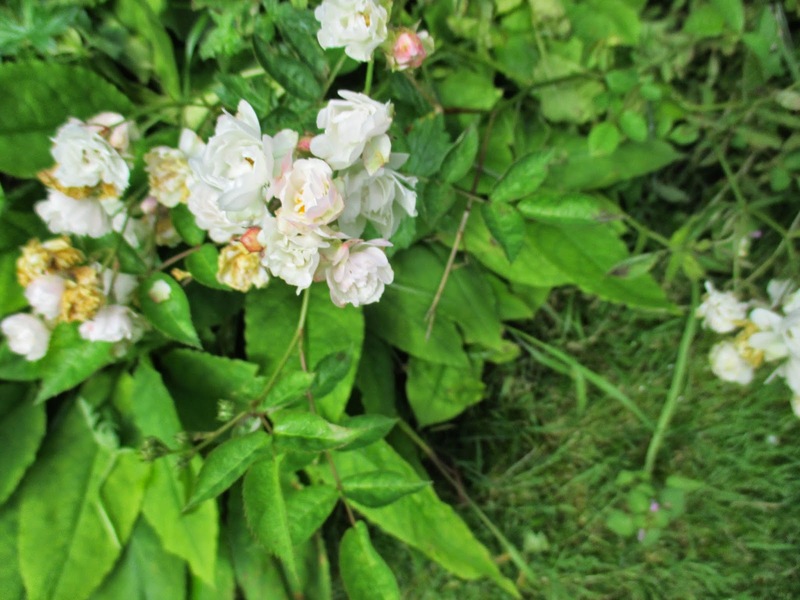 I have about a hundred of these miniature roses 'Garden Party' which I am using as edging for borders and to underplant larger roses. I grew some from seed this year, and , from an early sowing, they have been flowering for about three weeks now. I bought some as plug plants last year, and they grew quickly and flowered well. I am not totally convinced though as they are prone to fungal infections and look a bit leggy somehow. 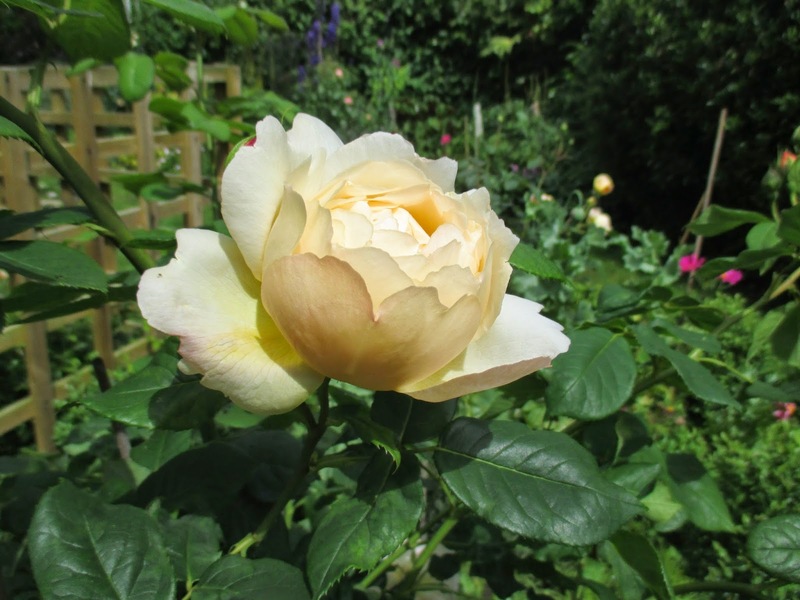 Another David Austin English rose - 'Charlotte', a pale yellow with pin tinged buds. I have found that it is prone to fungus, and isn't as robustly healthy as most of the other DA's. Still gorgeous though, it has a slightly 'uncombed' look to it, a touch of shagginess ! 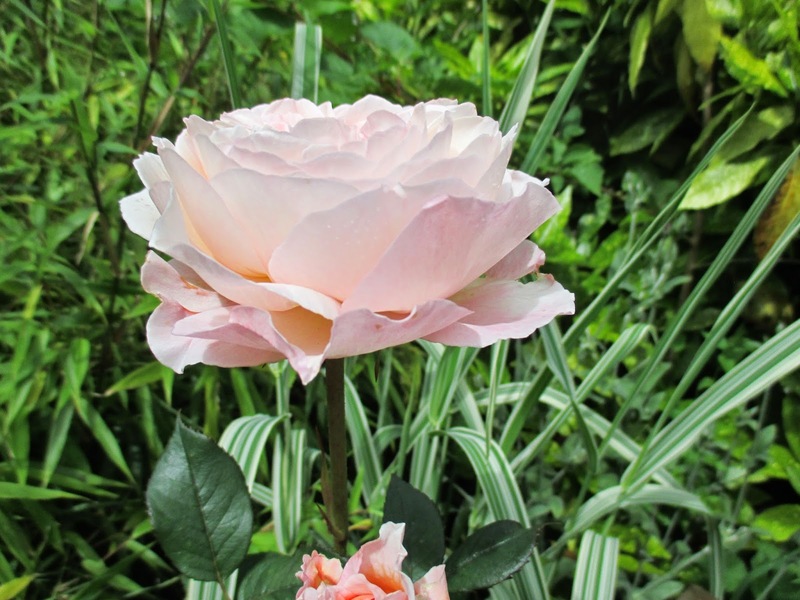 'This Sceptr'd Isle', a DA English rose, in shell pink. Apologies for poor photo! 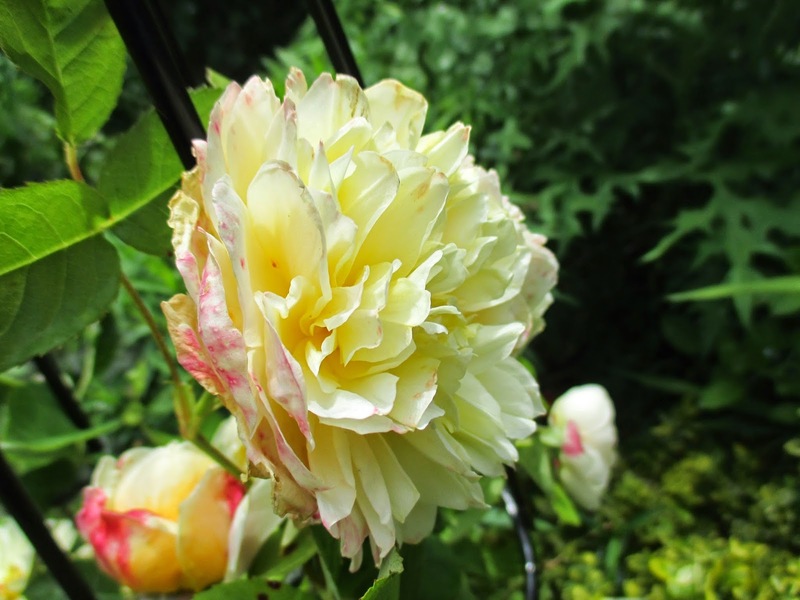 'Teasing Georgia', DA English rose, seems paler in my garden than in the many photos I have seen, but I do like the delicate pale yellow of the petals. 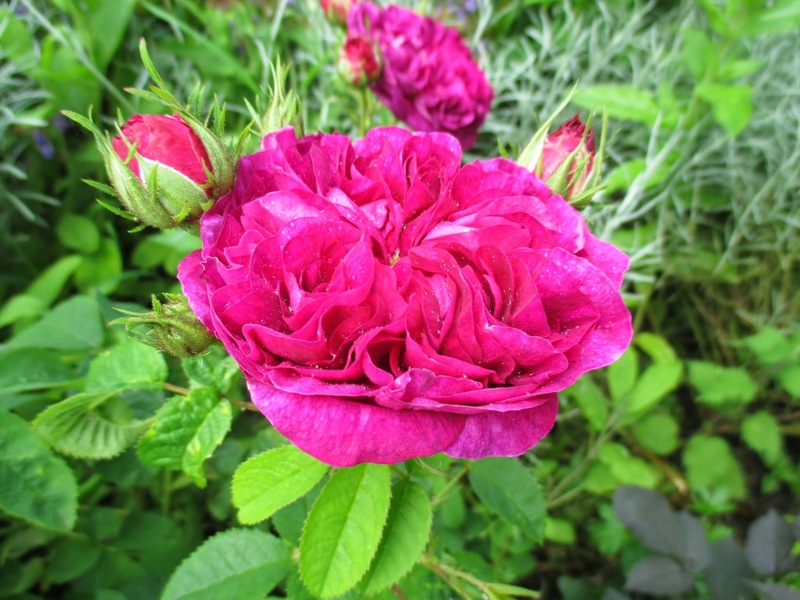 'The Countryman' is quite a rich pink in colour. 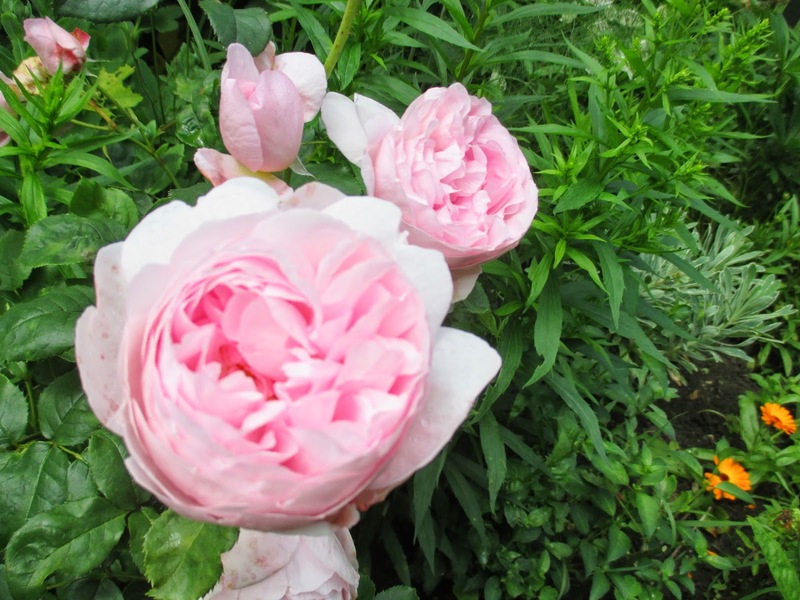 It is another DA English rose, and they are all renowned for being disease resistant and healthy. 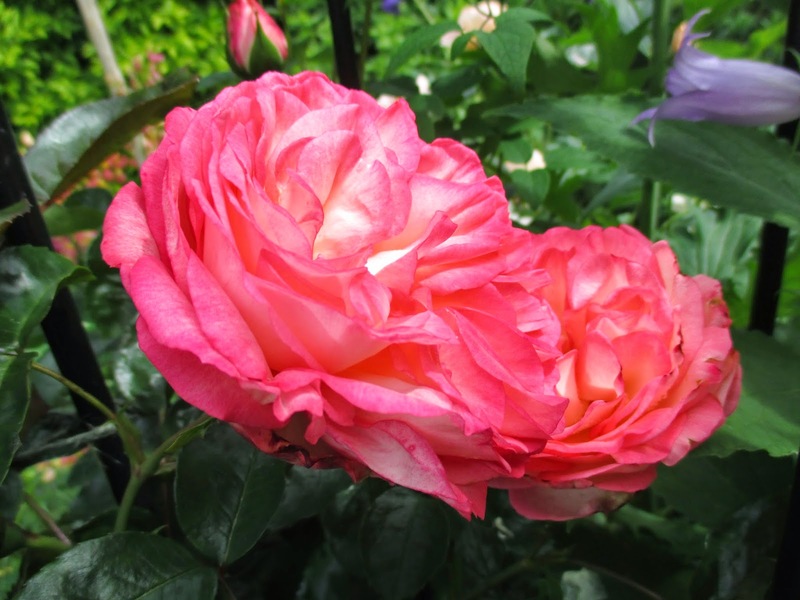 I bought this as a patio rose, 'Caribbean Dawn', but it is much more vigorous than would expect of a patio rose. It is only supposed to grow up to 60cm in height, and mine is there now after less than one season in the ground. Hey ho ! I am happy whatever ! 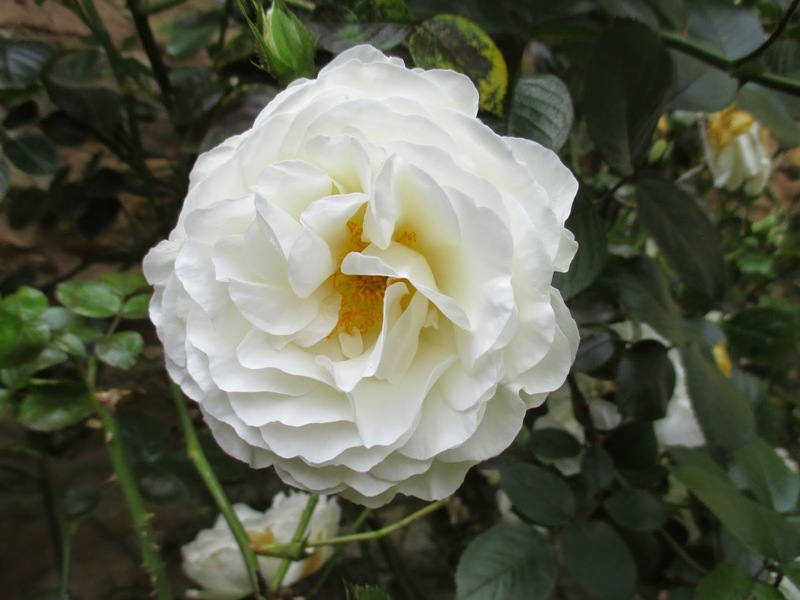 'Winchester Cathedral' yet another DA English rose. 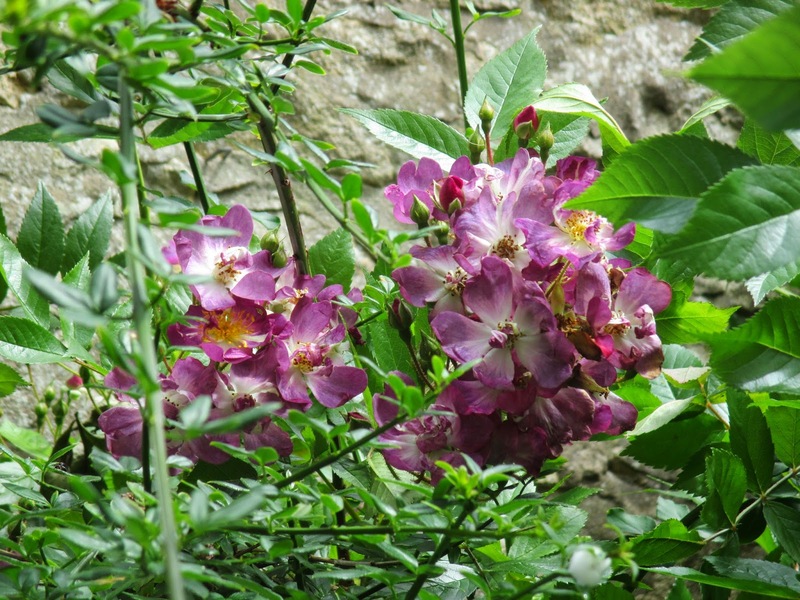 'Aloha' is a most unusually coloured climber and looks well next to the delphiniums. There is a clematis 'Nelly Moser', growing through it too. 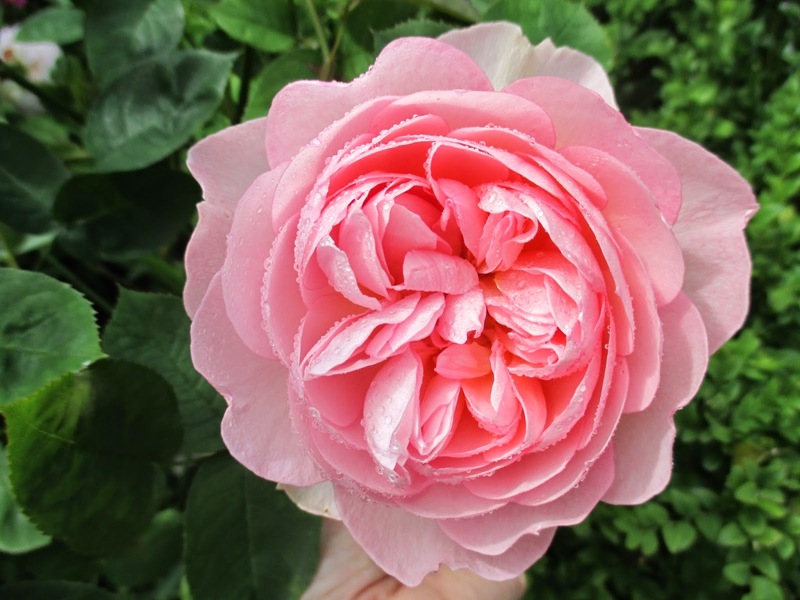 'The Shepherdess' is one of my favourite DA English roses. It is the softest pink imaginable. 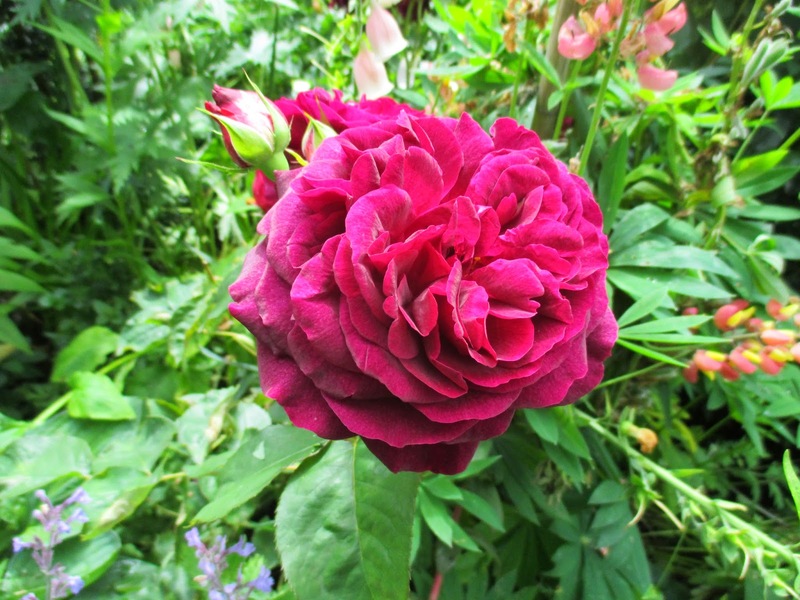 'Munstead Wood' is a dark, dark red DA English rose and has just won an award in the USA for its scent, which is fantastic. 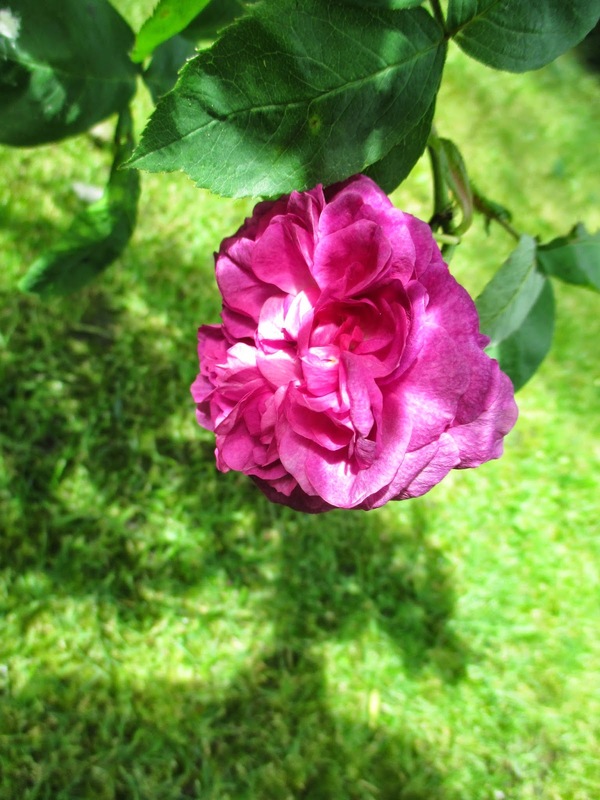 'Reine des Violettes' is an Old rose, a 'Hybrid Perpetual', bred in 1860. This is its first season with me, so I don't know how it will fair. I have read that it requires good cultivation to give of its best, so it is probably not the easiest rose to grow. 'St Swithins' was bought in memory of my dear mum, whose birthday was on St Swithin's day. A very special rose to me. It is another DA English rose. 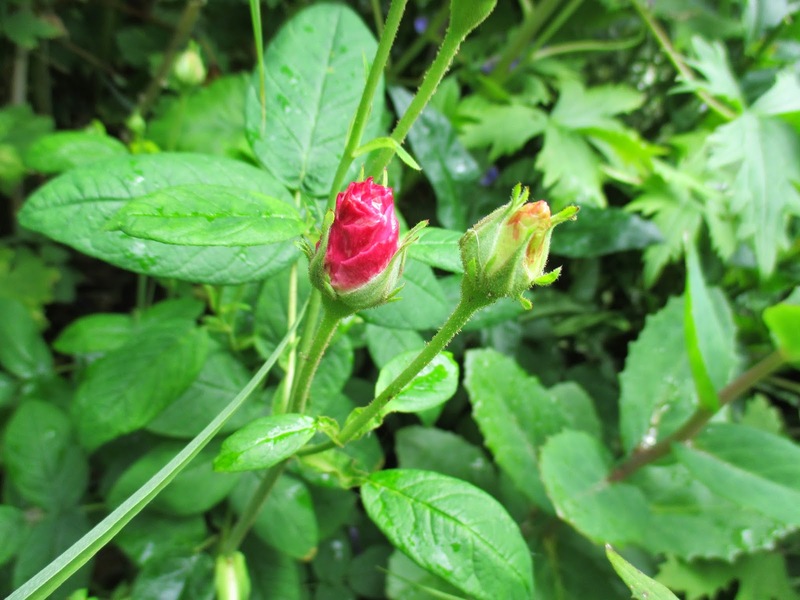 The last remaining flower of this single red rose, which is unknown. 'Lady Diana' was a gift from my aunt and is a climber. It took years to establish but has suddenly got into top gear this year. A new climber to me, 'Jasmina', which was another bargain. 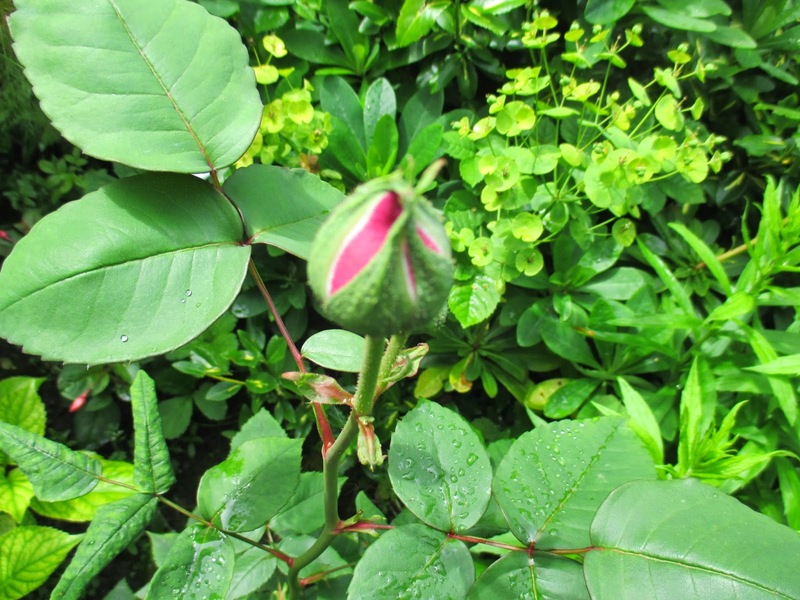 The jury is out as it has not yet bloomed this season, but is full of buds. 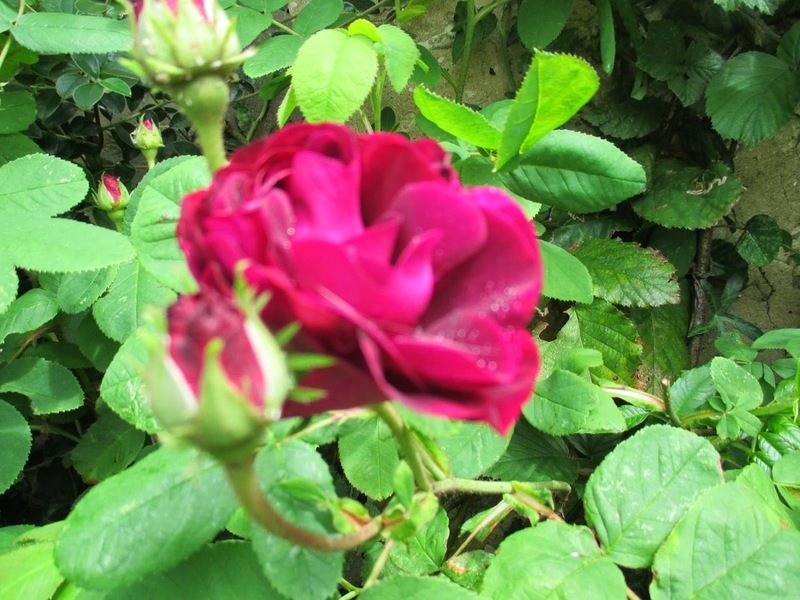 I can't wait for the Old rose 'Mme Isaac Perriere', a Bourbon, to flower for the very first time in my garden. 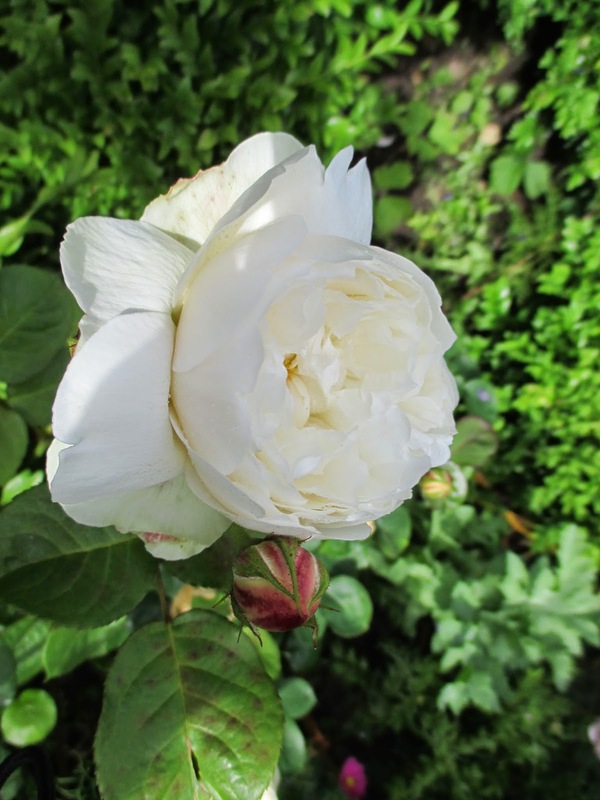 'Wollerton Old Hall' is my favourite rose of all. 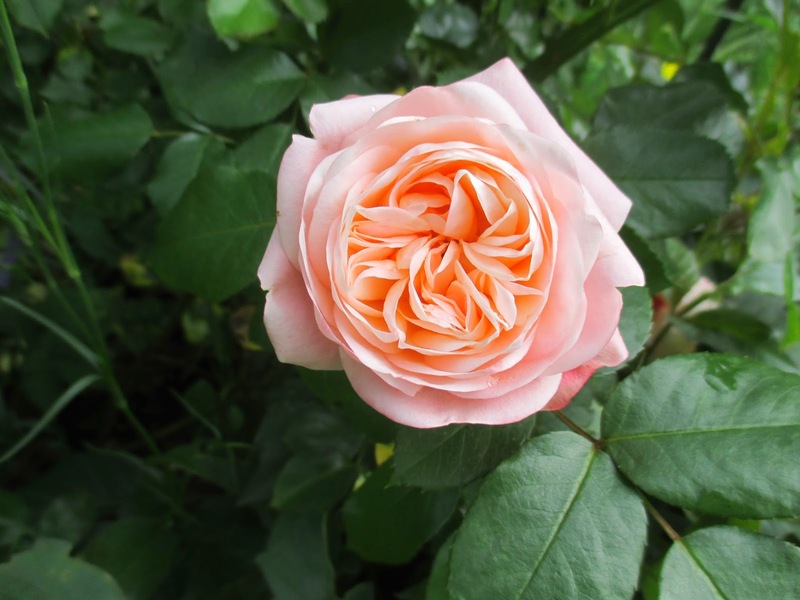 It is a DA English rose and it looks like a waterlily. The colour is so subtle and the perfume wonderful. It is extremely vigorous. 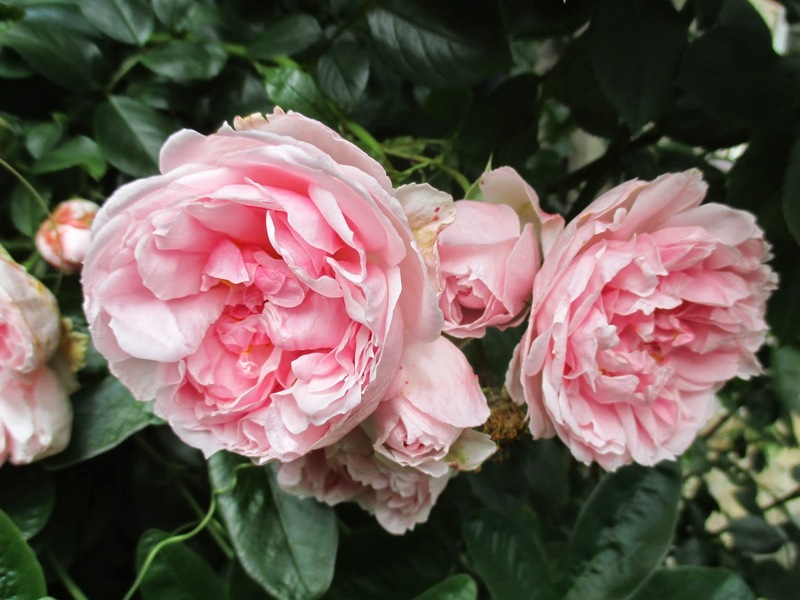 'William and Catherine' is a fairly new introduction to the David Austin catalogue , and has a somewhat stiffer habit than some of the more lax roses. It holds its flowers up all the time. 'Veichenblau', an unusual single climber, is just coming to the end of its flowering period, which has been disappointingly brief to say the least. I don't think it has enjoyed the heavy rain we have had. 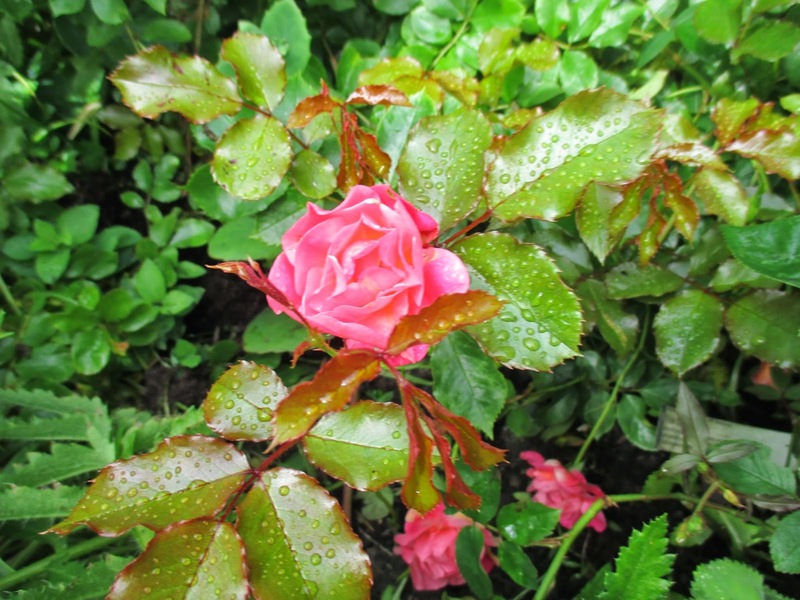 The rain has affected many of the roses and some flowers have been lost or spoiled. However, the sun has made a brief appearance today so maybe that is a good omen! 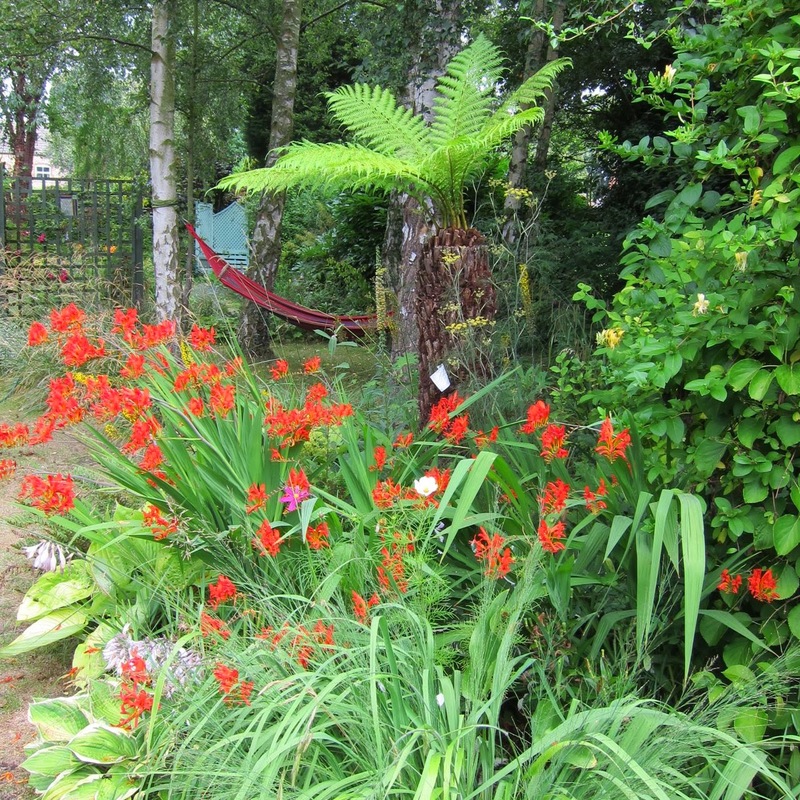 Blogger's Bloom day, hosted over at 'May Dreams Gardens' is a great way to see what is flowering right now, around the globe. There are some fantastic blogs to catch up with ! An abundance of riches. They are so lovely. Hi Cynthia. 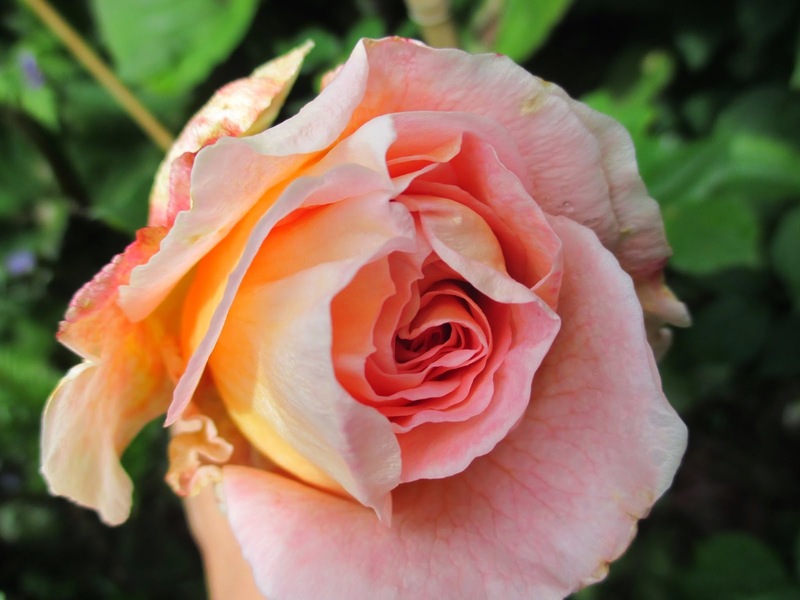 The rose must be the most sumptuous of flowers. All that beauty and fragrance too ! Gorgeous collection of roses. They look so fresh and beautiful ! Hi Ela. Thank you for your comments. They are at their best in June , they are just coming to their peak now ! That's some rose collection and hours of pruning! Hi Sue, I have a pair of very thick leather gauntlets ...!! Lovely selection, and the scent on some of them must be divine too! Hi Mark and Gaz ... shame it's not smell - o - vision !! Another rose geek! They are my passion. I enjoyed looking at your wonderful collection. It has been a funny rose season , they came out so early and many are going over now. 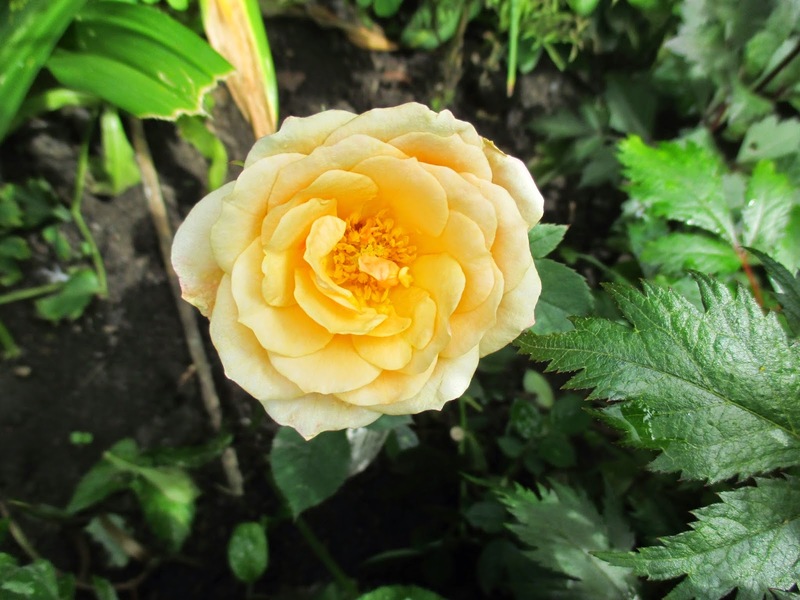 I love Gentle Hermione, such large beautifully shaped flowers and she is so healthy and vigorous. I shall be interested how you get on with Reine des Violettes. She does get terrible black spot with me as do all the Hybrid Perpetual. Maybe you will have better luck. Do you spray? 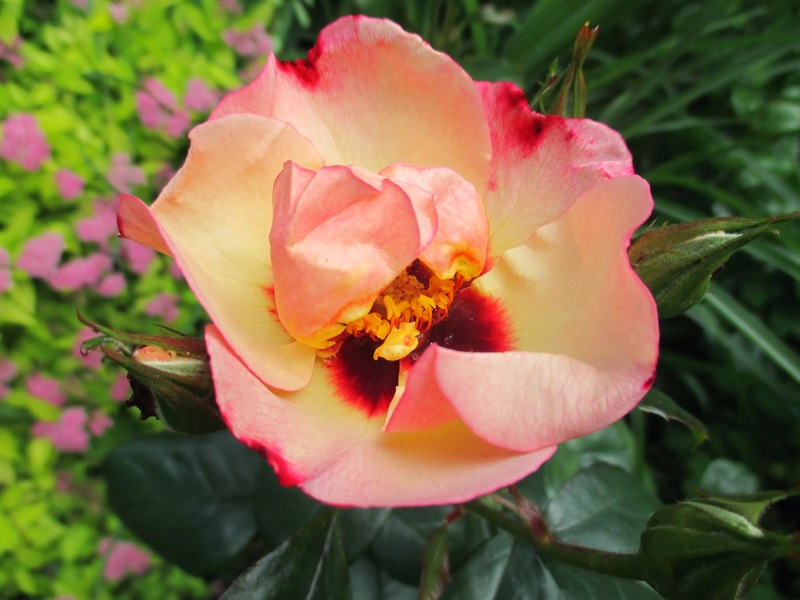 Hi Chloris I recognised you as a fellow Rose Geek immediately ! Lots of mine were out around mid May which is really early ! I would like to say that I never spray but I have sprayed occasionally, only if I think I will lose the rose if I don't. I try to keep them very healthy so that they can cope with pests etc, and am always looking at them to check for anything amiss. I have a feeling Reine des Violettes won't do well for me somehow, it seems quite 'fragile' and not very robust. I love Gentle Hermione too, but Wollerton Old Hall is my best fave !! Your a great selection Jane - I think 'geek' just about covers it ;) You certainly seem to know your thing. Happy Bloom Day! Hi Angie, hand up, I am out of the closet as a big Rose Geek!! Happy Bloom Day to you too - it doesn't get much better than June !! The best 'Veichenblau' I ever saw was espaliered on a west facing brick wall on the NSW Central Coast which has a warm, almost subtropical climate. The grower said he'd found they "like it hot and dry" although I think he also said it didn't have a long flowering period. Spectacular colour though! Here in NSW, many DA rose growers have also told me that they find the DA apricot selections nearly always end up a cacky buff colour after some years. I love all your big double blooms but I'm very taken with that unusual 'Alissar Princess of Phonaecia'. It reminds me of a Cistus flower. Hi Catherine, that is good advice about Veichenblau and mine is certainly dry, as it is planted next to a stone house wall. 'Alissar' is gorgeous and very Cistus like, but with more substance. 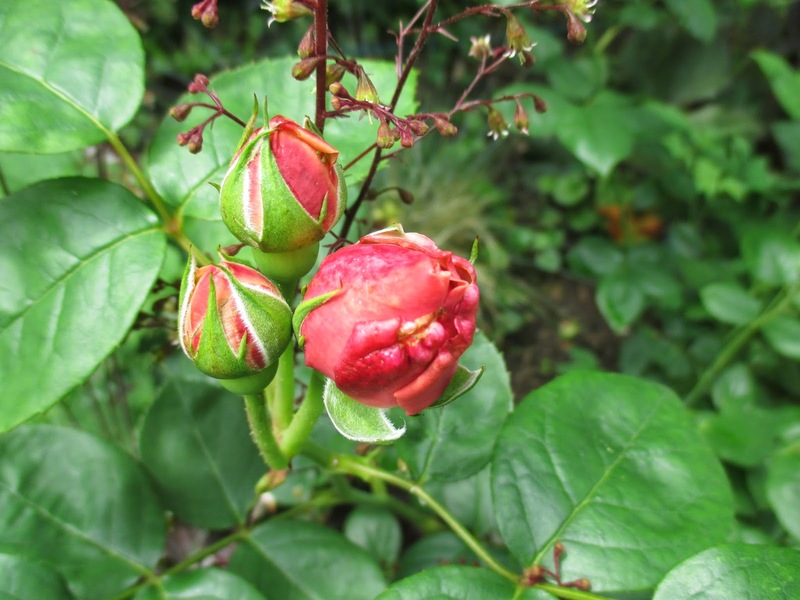 It is certainly an unusual rose here in the UK and I have not seen it for sale very often. Marvellous Jane. It seems like a good year for roses. Do I detect just a little bit of apricot creeping in.. Jude the Obscure?? Hi Jessica, I think your 'Apricot Radar' is working well ? Bloom colours change so much as each flower opens and matures, and the apricot is much more apparent in the early days of a bloom. Hi beth and thank you so much for your visit and your comments. So many beautiful blooms! You are a true rosaholic. I am impressed about the whole growing from seed thing too. This is a beautiful blog post. Hi Sarah, thanks for your visit and your comments. 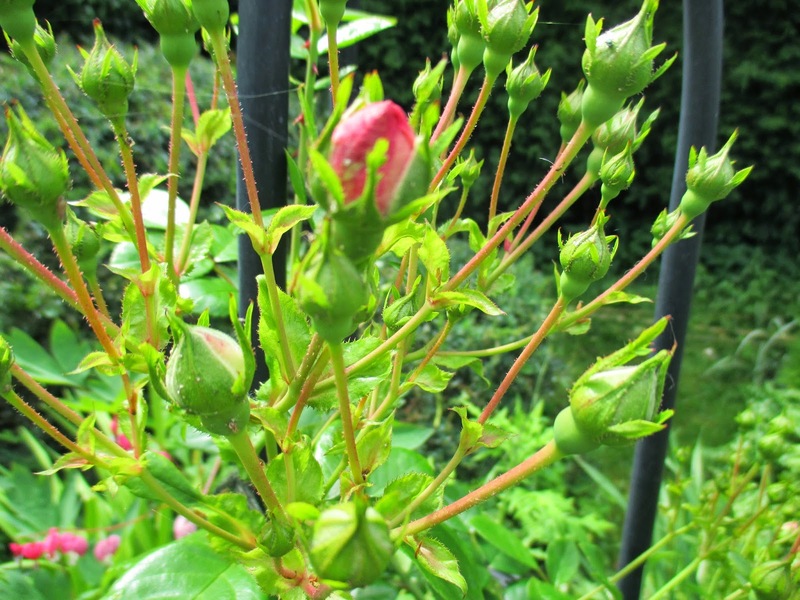 The roses from seed were REALLY easy as they were pre-treated and so didn't need stratifying. They are from 'Thompson & Morgan' and they flower weeks after sowing. Lovely! How many roses do you have altogether? 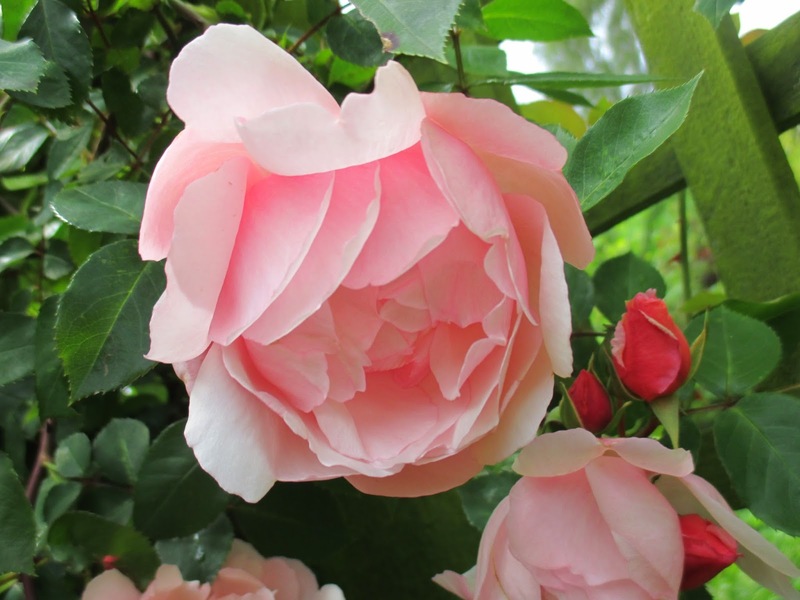 Hi Phillip, I have just counted up and found out that I grow over 50 different varieties and I guess I must have around 120 roses in total, as I have a hedge of Charles de Mills, and loads of little Miniature 'garden Party' roses. It must have taken you quite a time to put this post together, but the notes are very helpful and so I appreciate greatly all you have done. You certainly have an amazing array of roses! Quite a few caught my eye including the 'Munstead Wood' which I thought was very pretty. Hi Jennifer,thank you for your comments. 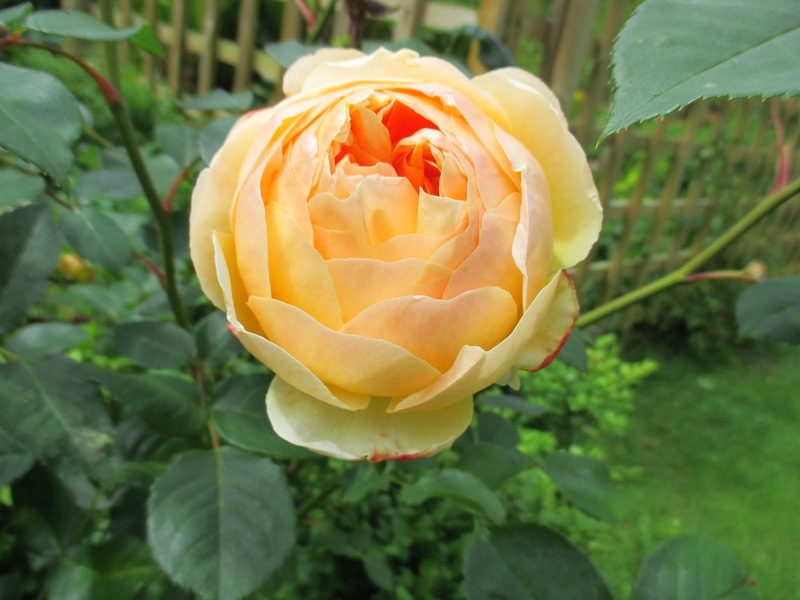 This post was a labour of love, I must say !Munstead Wood ticks ALL the boxes, as it is a beautiful rose and also has a truly fantastic scent. 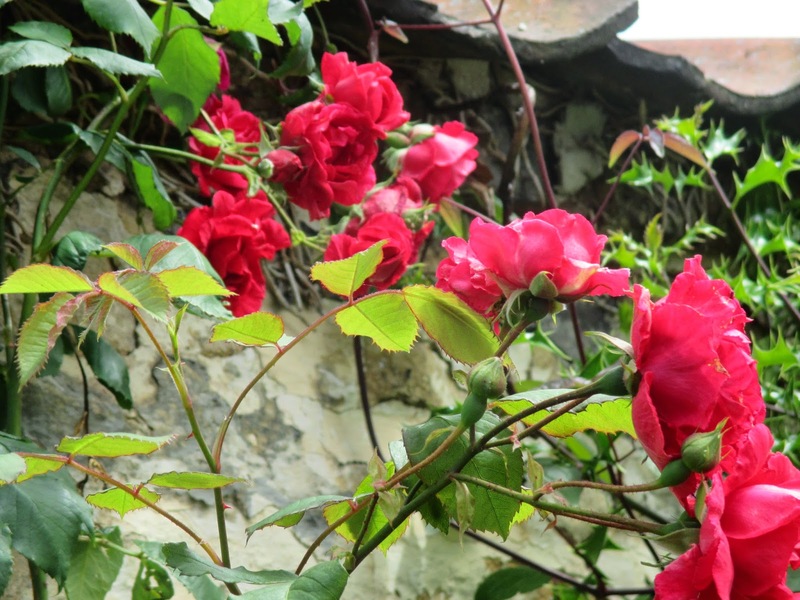 superb collection of roses - you are truly a rose geek, Jane. Hi Sue, sadly I have to own up to being a Rose Geek through and through ! What a truly fantastic selection of roses, your garden must be wonderful at the moment with a perfume to match! My Abraham Darby is more yellow than yours, I wonder if the soil has anything to do with the colour? Don't know how I missed your post first time round, better late than never! Hi pauline, the perfume is fab at the moment, especially when the honeysuckle joins in too! 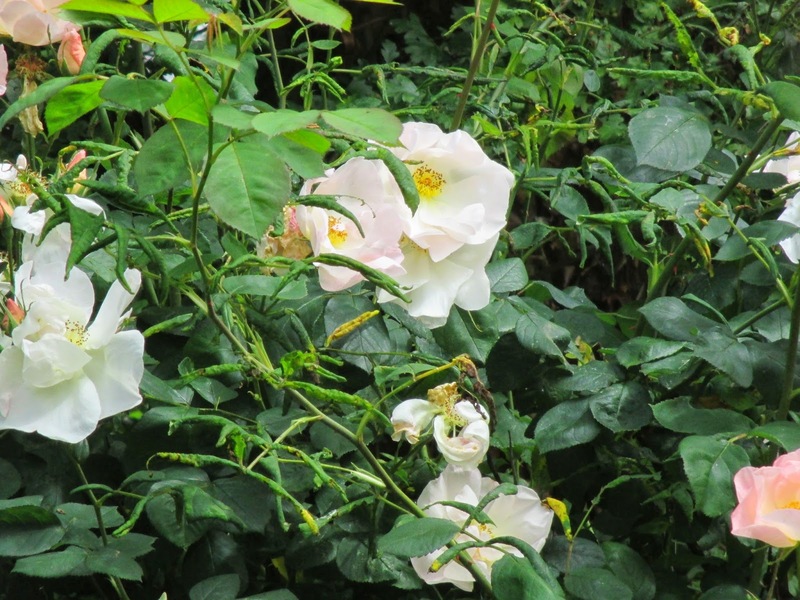 It is interesting that the same rose can differ so much from garden to garden. It could be soil , as you say, or position/ fading ... who knows !! Wow looking at the roses you have in your garden and not a spot of illness on the leaves I am getting very jealouse *positive ofcourse*. Overhere no rain came in for the past few weeks and it's so needed.